A phone that’s not without faults, the Blu Life Max is pretty basic, but so’s its price. For those who covet affordability over all else, it’s hard to argue with its $110/£90 asking price. If you thought the likes of the Moto G4 and Wileyfox Swift 2 X were cheap, think again. 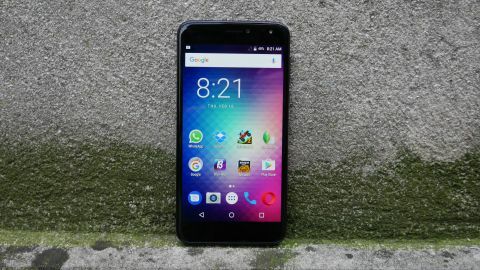 The Blu Life Max is the latest handset to pair solid specs with a bargain bucket price tag, the only difference here is that instead of coming in under the $200/£200 (around AU$260) marker, this phone can be snapped up for less than $110 or £100 (roughly AU$145). Never heard of Blu? Well let us introduce you. The American smartphone maker - who’s name actually stands for Bold Like Us - is the latest manufacturer to shake up the handset market. Not with innovative new features, stunning designs or big marketing campaigns, but by targeting users where it really matters - their wallet. Despite making other ‘affordable’ phones look positively pricey, the Blu Life Max is a device that pushes the envelope of what you can expect from a bank balance-friendly handset. Yes, cost-cutting compromises have been made, but there’s still enough left to this device to make it a phone that you’ll consider based on ability, rather than simply its price. So, just how cheap is the Blu Life Max? Well the phone, which is available now in the US and UK, but with no Australian release in sight, can be snapped up for just $109.99/£89.99 (around AU$145). That’s not just cheap, that’s less than half the price of the Moto G4 Plus, a handset that’s widely regarded as the king of the affordable phones. It’s also a price tag that could well reshape expectations of what budget phones should be. Affordable phones make compromises when it comes to feature lists and specs sheets. It’s an inevitability that comes with the need to cut costly corners somehow. Despite its seriously barebones price tag, however, the Blu Life Max hasn’t skimped on the features front too much. There are still two cameras, 5MP up front, 8MP around back, a large 720p display, and a huge, 3,700mAh battery. That’s not all that’s been squeezed in, either. A 1.3GHz quad-core chipset runs the show alongside a solid 2GB of RAM, and, while the phone’s 16GB of internal storage is modest, it can be expanded by up to 64GB via microSD card. So far, so good then. Pleasingly, the welcome additions aren’t limited to the phone’s hardware, but software too. Given that it’s still missing from most flagship phones, it’s no surprise that Android 7.0 Nougat is nowhere to be seen here, but instead, a largely untouched version of Android 6.0 Marshmallow has been included, with the near stock Android offering providing a fluid, user-friendly interface. It’s not just the basic essentials that this phone packs, either. A fingerprint scanner has also been slotted on the device’s rear, an addition still missing from many phones that cost more than three times as much. This isn’t just a token addition that’s more nuisance than assistance though. The phone’s biometric sensor is pleasingly responsive and speedy. It might not be on par with the iPhone 7’s Touch ID sensor or the fingerprint scanner on the rear of the Google Pixel XL, but it keeps misreads to a minimum and unlocks the phone in prompt fashion. Although, obviously, the Blu Life Max doesn’t feature a collection of specs ready to compete with the likes of Apple, Samsung and HTC, neither is this a phone that feels like stepping back to 2010. For the price, it doesn’t just feel well-rounded, but comfortably exceeds expectations. Sometimes cheap really does mean cheerful, and that’s certainly the case with the Blu Life Max’s design. You can forget metal edges or sleek, glass elements, plastic is king here. Devices like the Moto G4 have proven that doesn’t have to be a barrier to success though, and although simple and plain, the Blu Life Max features a form that feels well-built and is far from ugly or offensive. Well, for the most part. From the front, it’s a phone that actually looks a lot like the Moto G4. There’s a sizeable chunk of black plastic framing the screen, and finished with smoothly rounded corners. Flip the phone over, however, and things go downhill a bit. Instead of keeping things simple with a bit matt plastic for a comfortable, grippy feel, the Blu Life Max has been fitted with a faux-leather removable back plate. There’s even some fake stitching embossed into the ugly plastic rear to really try and class things up. It’s all a bit Samsung Galaxy Note 4 and, although designed to boost the phone’s design appeal, actually makes it look and feel cheaper than it should. It’s a design addition that’s more market stall than high fashion. Unfortunately, with just one color scheme available, there’s no hiding it behind a different paint job either. Instead, if you plump for the Blu Life Max, you’ll have to make do with a black-fronted phone that has blue tinges to its side and rear. A faux-leather rear isn’t the phone’s only design quirk either. Somewhat unusually, Blu has opted to fit the phone’s power connection port - an old fashioned micro USB attachment, there’s no USB-C here - to the phone’s top edge. While this doesn’t make any difference while out and about, use the phone in bed or while lounging on the sofa, and things can get a bit awkwardly contorted if you’ve got the phone plugged in. The reasoning behind it is hard to fathom, too. Although the move has allowed a pair of speaker grilles to be squeezed in to the base of the phone, given only one of them actually pumps out audio, it all feels rather redundant. Small niggles aside, this is a phone that looks and feels nicer than its price would suggest. At just 8.7mm thick and 153g in weight, it’s notably slimmer than the 9.8mm plump Moto G4, and is comfortable to hold despite its 5.5-inch display. Unlike the phone’s design, which exceeds price point expectations, the Blu Life Max’s screen is everything you’d expect from an entry-level handset - grainy, dull and generally disappointing. That’s because the Blu Life Max packs just a 720 x 1280 resolution. While this would be fine on a smaller phone, having been stretched over a 5.5-inch panel, things are underwhelming at best. The size and resolution combine to form a screen with a lowly 267 pixels-per-inch image density. That’s low enough to give all text a notable level of distortion and a lack of definition. It also makes video viewing a particularly underwhelming affair. Compared to other ultra-affordable smartphones, it’s reasonable, but the rest of its specs list is closer to devices of twice the price.